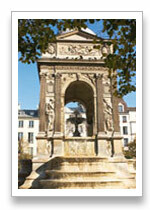 This Right Bank area is dominated by the modernistic Forum des Halles and the Pompidou Centre. 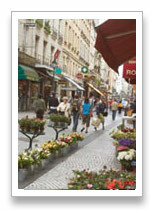 These two spectacular places are thriving public areas of contact for shoppers, art lovers, students and tourists. Literally millions flow between the two squares. Les Halles is for the street fashion with most if the shops underground. The clientele strolling under the concrete and glass bubbles is young. The surrounding streets, coloured by popular cheap shops and bars, are undergoing refurbishment to combat their seedy image and there are still enough specialist food shops, butchers and small markets to recall what Les Halles must have been like in its prime as the city�s thriving market. 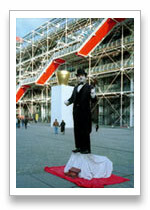 Just a few steps from Les Halles, the Beaubourg area and the Centre George Pompidou, an avant-garde assembly of vast pipes, ducts and cables, renovated in the 1990s to cope with its 20,000 daily visitors. 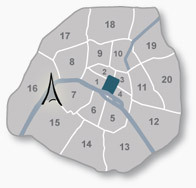 The streets nearby such as Rue St-Martin and Rue de Beaubourg, house small contemporary art galleries in crooked, gabled buildings.